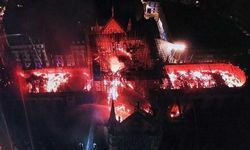 Moscow, April 17, Interfax - The Russian Orthodox Church painfully perceives the wide-scale fire happened on Monday evening in Notre Dame de Paris. "It’s hard to express the pain. Our eyes are full of tears. These "old stones of Europe" are also a part of our soul, our spiritual history. This terrific loss, I believe, unites us with western Christians, who are going through the Holy Week," deputy head of the Synodal Department for External Church Relations Archpriest Nikolay Balashov told Interfax. The Russian church official sees the sign in this fire. "It is hard to get rid of the thought that we witness to an omen, the true sense of which we are yet to understand. The world will never be the same."